Day 44. As I was rushing around this morning in the closet, and dressing more for 'convenience' then 'style', (I confess), something happened when I put on some big funky earrings. Wha-la, instant 'style'! So don't underestimate the power of cheep accessories! 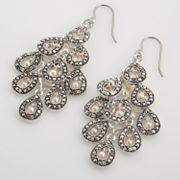 Check out the Trends section at the Kohls link below for these earrings, only $14.99! And more style surprises.